An integral Westminster Chime pendulum movement with seperate loudspeaker. Chimes on the hour. We recomend you use one of our pendulum rods and bobs as these modern units may not swing old heavy pendulum rods and bobs. Size approx 80mm wide x 110mm high x 28mm deep. For hands see hands for German eye shaft movements. 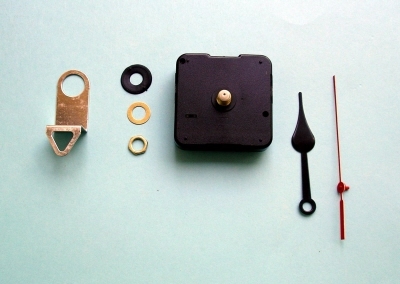 Turns most AA battery movements without integral hanger into a pendulum movement, runs a separate AA alkaline battery. Will not fit our economy movements without sawing off the hanger first. For hands see hands for German eye shaft movements up to around 150mm (min). We recommend you use one of our pendulum rods and bobs as these modern units may not swing old heavy pendulum rods and bobs. 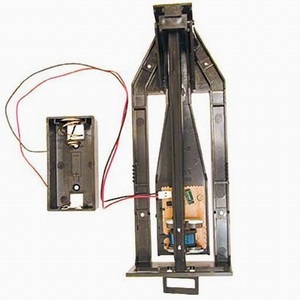 A powerful pendulum drive unit. 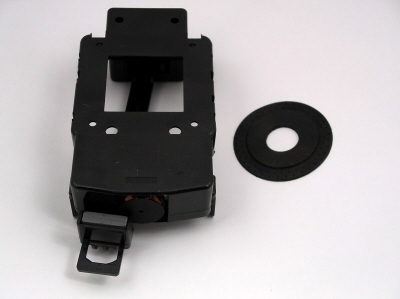 Uses a D cell battery, which is installed in a remote battery box, that can be positioned almost anywhere In your clock case to make changing batteries very easy. You can now make grandfather size quartz clocks with a traditional sized pendulum bob up to around 225 g on up to 1 metre long rod. A single handed Tide movement. The hand rotates at 12 hours and 25 minutes to the normal 12 hour rotation of other clocks. This is half the lunar cycle of 24 hours 50 minutes which governs high and low tides. Takes a single Alkaline AA battery order separately under tools. Note that the 24 hour 50 minutes is an average figure based on a 29 1/2 day cycle. Actual high and low tides may vary due to local wind conditions causing tides to be slightly earlier or later than indicated. For dials up to 6mm thick. A 4 handed movement with Hour, Minute, Second and tide hand. The tide hand rotates at 12 hours and 25 minutes to the normal 12 hour rotation of the other 3 hands. This is half the lunar cycle of 24 hours 50 minutes which governs high and low tides. A 4 handed movement with Hour, Minute, Second and 7 DAY hand. The Day hand rotates at the rate of once every 7 days. Size approx 70mm wide x 105mm high x 28mm deep. This Bim-Bam movement strikes two different copper rods on the half and the hour, with an hour count on the hour, can also be operated without a pendulum. This movement will not operate a second hand and may not drive big heavy antique pendulums. Dimensions: W150mm x H160mm x D52mm shaft is 20mm long suitable for dials up to 10mm thick. 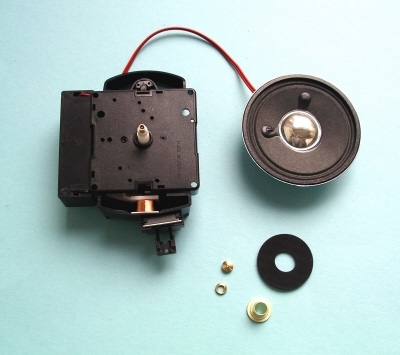 Superior mechanical sound, Can Operate with or without pendulum, Takes 1 "D" cell Battery. 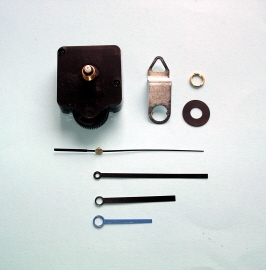 Choose hands from hands for German Eye Shaft Movements and pendulum from pendulum rods and bobs section. 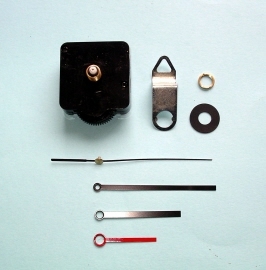 This movement has a more powerful coil and will drive LIGHT BALANCED minute hands from our list up to about 360mm long. 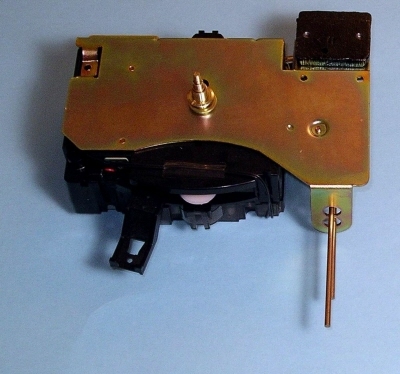 For identification this unit has a green hand adjust wheel.